STRIPED BASS fishing is fantastic. The big fish keep on rolling in so to speak. Its[sic] impressive how many large striped bass are being caught and released. Dawn and dusk is prime time for large stripers on the reefs, rip areas and lower coastal tidal rivers. Live lining eels, bunker or hickory shad has been the ticket. There is plenty of bunker throughout LIS including the tidal rivers to hold fish. BLUEFISH fishing has become more consistent with a mix bag of fish in the 3 to 9 lb range. The Race, Plum Gut, many of the major rocky reefs, rips, and shoal areas in LIS will harbor bluefish. Speed squidding diamond jigs, trolling parachute jigs or umbrella rigs, and using fresh bunker or hickory shad chunks on three-way bottom rigs have all been effective. Other bluefish spots include the Sluiceway, Gardiners Bay, Peconic Bays, and the north shore of Long Island along with the Stratford Shoal area. My recommendation is to hook up with a Party or Charter Boat and enjoy some of the best FISHING you will ever experience. Snappers (juvenile bluefish) have not arrived yet! SUMMER FLOUNDER (fluke) fishing is hit or miss for “keepers”. The eastern sound is getting more fluke as they move off Montauk Point. Mid to western LIS anglers are still reporting large fluke from 3 to 9 lbs. (Stratford/New Have/Woodmont area). Fluke spots include south shore of Fishers Island (Isabella Beach, Wilderness Point), Watch Hill to Napatree Point, off the Stonington breakwater, mouth of the Mystic River to Groton Long Point, Thames River channel, Gardiners Bay over to Greenport, NY, Twotree Channel, Black Point/Niantic Bay, Long Sand Shoal, Westbrook-Clinton area, Falkner Island area. Also, New Haven Harbor to West Haven, off the mouth of the Housatonic River, Norwalk Islands, and across over to Port Jefferson, NY. Since squid are coming in large numbers, offering a live one on the bottom (10-40 feet) would be a good move for catching that big slab “doormat” fluke and becoming the “Duke of Fluke”. Try drifting with a white or pink Bucktail Jig and attach a Berkely 3”- 4” Gulp Mullet in chartreuse, white or pink color. Fresh 2016 CT DEEP Weekly Fishing Report No. 10, 6/16/2016 squid and or silversides (spearing) have also been producing. Minimum size is 18 inches and the daily creel limit is 5 fish per person. SCUP (porgy) fishing is very good in Long Island Sound. These scup are very large and delicious to eat! Seriously, try fishing for some “reef slammers” and enjoy some great fishing...there are lots of scup around for all. Porgies measuring 11-18 inches (“hubcap size”) have been caught! Porgy fishing has also been reported at these shore fishing locations: Rocky Neck State Park, Harkness Memorial State Park, Meigs Point Hammonassett State Park and Fort Trumbull State Park. 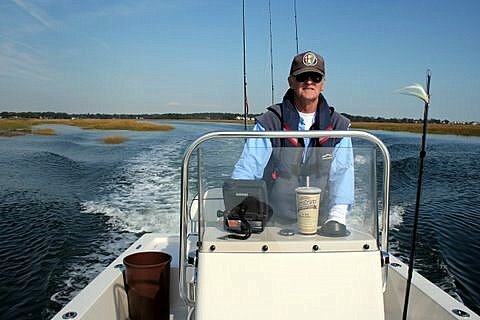 Locate your favorite Enhanced Shore Fishing Opportunities for these hard fighting and excellent eating “Reef Slammers”. These “panfish of the sea” are easily caught on sandworms/cut squid or any other small piece of bait. BLACK SEA BASS fishing is getting hot and showing no signs of slowing down. Fishing over any deep water structure (gnarly bottom preferred) in 30 to 75 ft around slack tide will produce some trophy-sized “humpbacks”. Fish shallower and you will catch plenty of keeper-sized sea bass along with fluke and sea robins. It’s important to continue to move from structure to structure to find these beautiful and awesome eating fish. Remember, CT black sea bass regulations are 15 inch minimum length, 5 fish daily limit from May 1st to December 31st. Berkely Gulp (swimming mullet), on a jig along with squid with a spinner works great for these “Bucketmouths”. WEAKFISH fishing continue to impress. Good fishing in New Haven Harbor by the breakwaters over to Woodmont/Milford Point and along Stratford shoals. STRIPED SEA ROBIN fishing continues to be steady for this “hardhead fish with spines and large pectoral fins”. These beautiful and strange looking fish are very common especially when bottom fishing at many of Connecticut’s shore fishing sites. With fish measuring over 23 inches and “barking up a storm” (grunting noise they make when handling them). They love sandworms, squid and any live or dead bait. They are also very good to eat. Please be careful when handling them...be mindful of their spines located on top of their head and gill cover. HICKORY SHAD fishing remains fair to good in the Black Hall River, lower Connecticut River by the DEEP Marine Headquarters fishing pier and in Clinton Harbor. 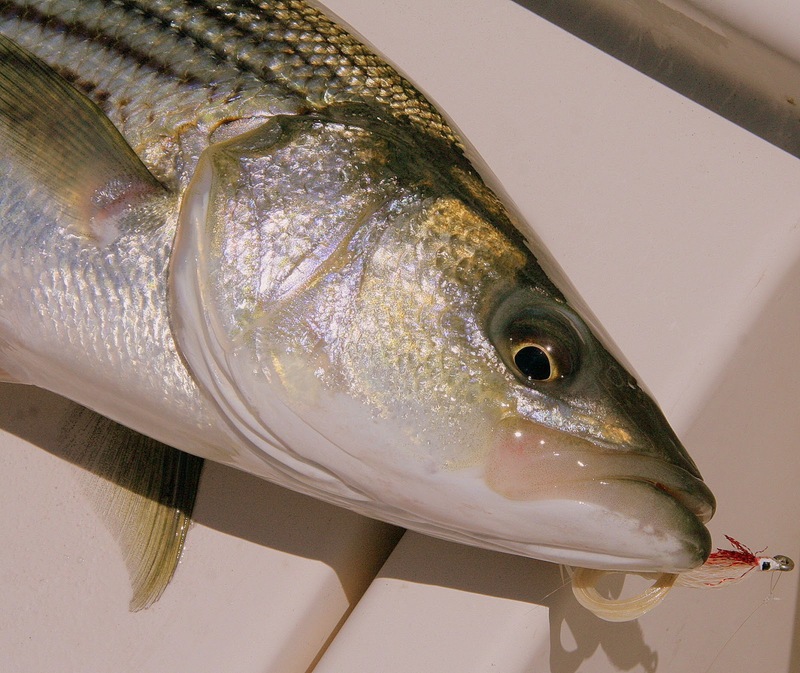 Connecticut Tarpon (Hickory shad) can be found mixed in with schoolie striped bass. Flood or the beginning of the Ebb tide is typically the best and lures of choice are a willow leaf (silver), kastmaster (single hook), small plastic jigs (white or chartreuse), and or shad darts in various colors. You will be impressed with these “high flyers”. WHITE PERCH fishing is good for these tasty panfish related to striped bass. Perch are found in most of the tidal rivers and coves along the Connecticut shoreline. Productive spots include the Pawcatuck River, Mystic River, Thames River, upper Niantic River, lower Connecticut River (DEEP Marine Headquarters fishing pier), Black Hall River, Lieutenant River, North/South Cove and Hamburg Cove. Grass Shrimp and a small piece of sandworm fished on the bottom are the keys to success. Another 14.5 inch 2.3 pound white perch was caught at Ferry Landing State Park in Old Lyme on a sandworm this past weekend under the railroad bridge.